Red or Blue – ALTY NEEDS YOU!! The match on Saturday, 27 January (3pm) against the Robins’ promotion rivals coincides with the fourth round of the FA Cup. United are playing at Yeovil on Friday night, with City in action at Cardiff on Sunday – a perfect opportunity then for all to enjoy the unique hospitality of the J Davidson stadium. 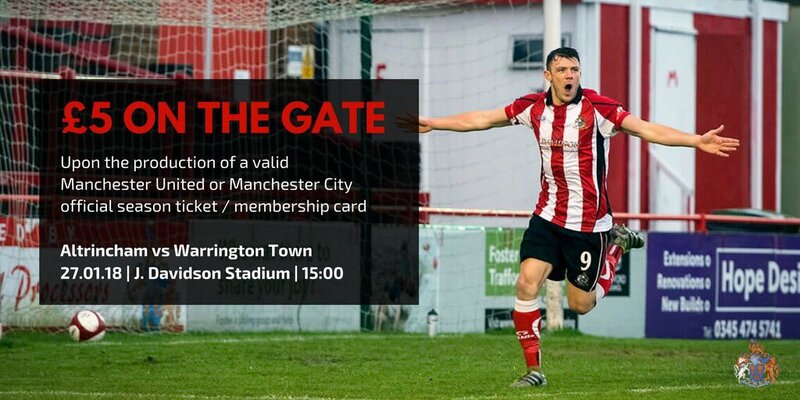 United and City fans are being urged to support their local community club and can gain half-price entry on display of a season ticket or membership card. These are exciting times for Alty. The first team is top of the table and on course for a return to National League Football; a partnership has been agreed with Altrincham Unlimited – the organisation responsible for promoting and driving business in the town – while the club’s share offer is attracting interest both locally and from further afield. Last year the Board called an Extraordinary General Meeting to pass a motion allowing the club to bring in significant investment by making further shares available for purchase. Following approval, the club acquired 117,000 non-voting shares – roughly 51% – which have been converted to voting shares and are now held in Treasury. The club is now able to sell the shares to a suitable investor, or investors, who share the Board’s ambitions.